Mark Webber admits that returning to the Le Mans 24 Hours for the first time since suffering two aerial accidents with Mercedes in 1999 will be a 'personal challenge'. The nine-time grand prix winner will switch from Formula 1 to sportscars with Porsche in 2014, and he had his first test of the marque's new LMP1 car this week at the Algarve circuit. His maiden campaign in the World Endurance Championship will also take in Le Mans, where he has not raced since being part of the disastrous Mercedes entry in 1999. Speaking in an exclusive interview with the FIA's AUTO magazine, Webber said: "There were a lot of cars flying in the 90s. "As drivers we're well used to getting back on the horse and dealing with those personal battles. "But under the circumstances there was no way for us to re-group and re-do the race properly. "So yeah, for me to go back there after some of the incidents is a personal challenge as well." Webber suffered two aerial crashes in the build-up to the 1999 race, and Mercedes withdrew its two remaining CLR entries after Peter Dumbreck was involved in a similar accident during the race. 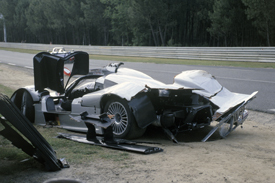 Despite his last experience of the race being so bad, Webber revealed that he has "always enjoyed" driving at Le Mans. "I love the long lap," he said. "And it's a different animal at dusk, at dawn, and during the night. "I love the build-up to the race and the feeling of endurance and the many different facets that are required to get the car from 2pm to 2pm, 24 hours later. "That's a very special experience."